Now that Samsung Galaxy S7 is here, it is time to get to know it better. While you can sit around an entire day and try to find out what’s the new Galaxy S7 made of and what’s inside it, there is an option of letting us do the dirty work for you and outline to you the best parts of how to get to know the new S7 a lot better and in a hassle-free manner. In this line, here are 5 awesome Samsung Galaxy S7 tips and tricks you need to master in order to know your way around the new phone. Customization is what makes the Android OS a much better option than iOS. Users can make changes to almost every setting that comes with the phone out of the box. Whether it is the home screen appearance, phone settings, display or even the lock screen, you have it all covered. Samsung Galaxy S7 came in with new screen technology known as Always On. This technology keeps the screen lit up even when the phone goes to sleep such that there is no need to wake it up so as to check for things like date or time. To play around with this feature, head to the S7’s Settings>Display>Always On Display and then pick the type of content you want to be displayed on the screen. As of now, the only problem is that the feature is not compatible with non-Samsung apps, so don’t expect to see notifications from apps such as WhatsApp, Facebook Messenger or Google Hangouts. However, this support is on the way, especially given that LG G5 has the same Always On feature, but all apps are supported, including non-LG apps. To personalize the Galaxy S7 home screen, tap and hold on any empty space on the screen to pop up the customization options. Users can add more home screens or delete them. Tapping, holding and dragging the home screen to the bin will get rid of them. There is also room to change the grid to your desired size so that it fits better with the size of the icons. If you feel like, you can also change themes, wallpapers as well as set up widgets. 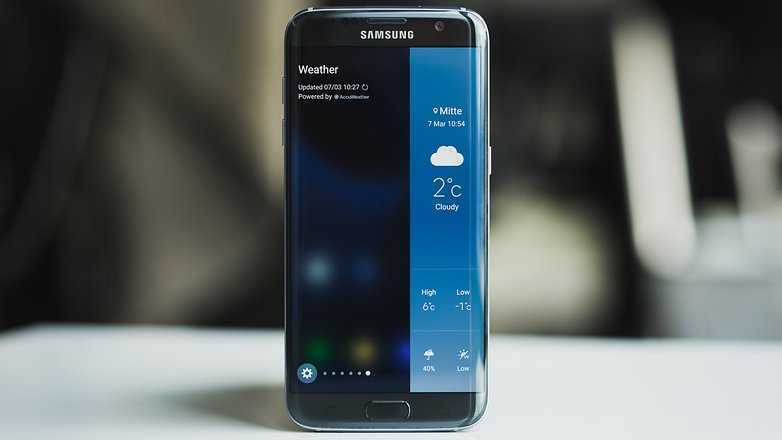 Android Marshmallow brings to the fold the Do Not Disturb feature on the new Samsung Galaxy S7 so that the phone doesn’t unnecessarily wake you up or maybe disturb you when otherwise engaged. This setting is available in Settings>Sounds and vibration>Do not disturb and from here, predefine a schedule of how you want the feature to work on your S7. There is room for exceptions right at the bottom where you can add custom settings like allowing calls from certain persons to go through even when this Do Not Disturb feature is turned on. Using custom settings will with no doubt save you lots of time. By swiping down from the upper end, the notification panel will be opened. A simple tap on the wee arrow on the right then follow it by tapping on “Edit” will allow you make changes to the Quick Settings toggles displayed on the panel and in the order you’d like. You can have your Samsung Galaxy S7 lock screen showered with multiple wallpapers. To do this, simply head to Settings>Wallpaper>Lock Screen>From Gallery and go on and pick your preferred images to use as wallpapers. There is room to include up to 30 different photos and have them displayed in rotation. Previous Previous post: Samsung Galaxy A5 (2016): The Next Best to Samsung’s Flagship Series?